Geoff and his wife Shanna Maltby work alongside their family on a 120 acre farm in Acton raising livestock and growing grain crops. 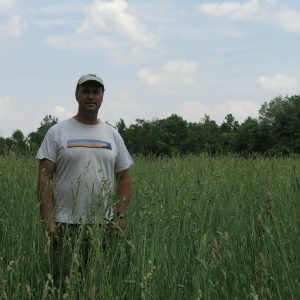 When CVC launched the Bird-Friendly Certified Hay Program three years ago, Geoff was one of the first farmers to join. He agreed to delay the date he cuts hay to protect grassland birds. He enrolled a 10 acre hay field that turned it into a safe breeding and nesting ground for grassland birds. Geoff explains, “It doesn’t make much difference to me to delay the cutting of my hay field, but for grassland birds it means they survive.” Grassland birds such as bobolink and the eastern meadowlark breed make their nests on the ground in grasslands. In the last 10 years, bobolink and eastern meadowlark have experienced population declines of 33 per cent and 25 per cent, respectively, due to loss of natural grassland habitat. Thankfully, late cut hay fields provide a suitable alternative habitat for grassland birds. “I can give you a dozen reasons why to grow bird-friendly certified hay but not one reason on why not to.” Motivated to protect grassland birds on his farm and by the quality of hay produced to feed his own horses, joining the program made sense. It is a natural extension to Geoff’s farming operations and stewardship ethic. He has also built a manure storage facility, planted five acres of a former paddock in a floodplain and fenced out livestock to protect the community’s nearby well water sources. Geoff took advantage of the Growing Forward 2 funding program and subsidies from CVC for the plantings. He also maintains fencerows between fields to provide links between natural areas for wildlife.